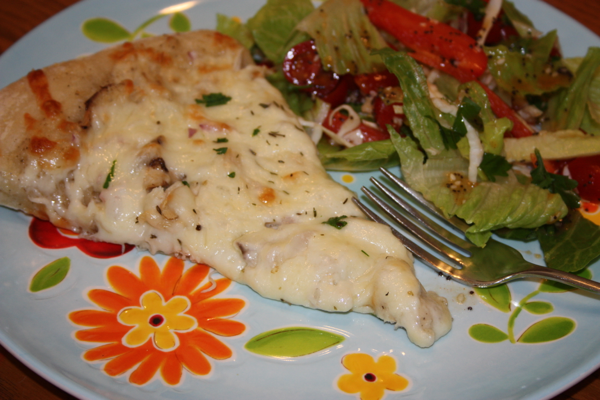 Grilled pizza is one of my all-time favorites and is a “spécialité de la maison” for us! I think it is the closest you can come to a wood-fired pizza at home. We love to grill pizzas in the summertime and top them with loads and loads of fresh veggies and this sauce. Each person can customize their pizza and the pizza is a great way to use the veggies you find at the farmer’s market. YUM! I found this recipe years ago in the newspaper and have been using it diligently ever since that discovery. The only complaint I have is that I can’t really serve these to a crowd because of the limited grill space. We do on occasion double the dough and invite friends, but until we have an extra large grill there is quite a wait since our grill only holds two pizzas at a time. We have experimented with grilling the crusts ahead of time and finishing the pizzas in the oven, but if you want to do this all on the grill, you will need multiple grills or a huge grill to feed a party. You could easily adapt this and create hors d’oeuvres that would be sure to impress your guests. Try this with your favorite pizza toppings. I would love to hear what your creation turns out like. My favorite is half pesto, half tomato sauce topped with zucchini, fresh tomatoes, mushrooms, sautéed onions, mozzarella, feta, and fresh basil. Jeffrey is cutting up his pizza. 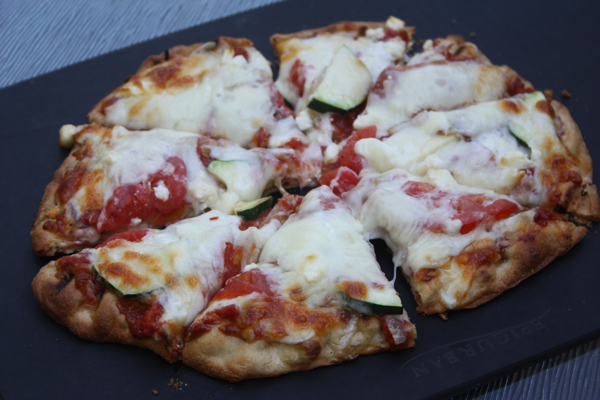 His was topped with pizza sauce, zucchini, sautéed onions, sliced tomato, salami, feta, and mozzarella. Sprinkle yeast and a pinch of sugar over water in a small bowl. Let stand for 5 minutes, until the yeast is bubbly. Stir in 2 tablespoons extra virgin olive oil. Once the dough has doubled in size, punch the dough down and divide it into 4 equal pieces. Cover and let rest for 15 minutes. Prepare the grill to medium-high heat. On a lightly floured surface, roll each piece of dough into an 8-inch circle. Stack dough between sheets of waxed paper that has been sprinkled with cornmeal. 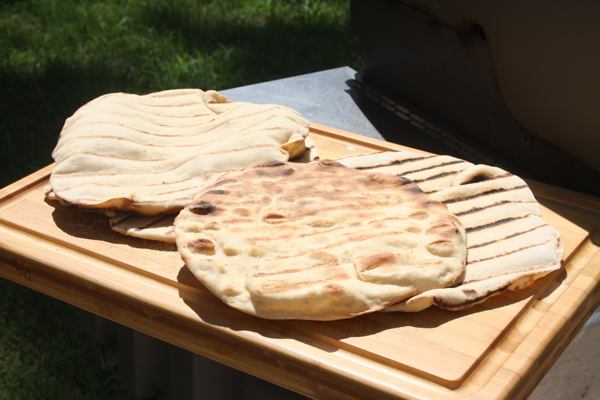 (We have found that individual plates sprinkled with cornmeal are much easier to work with because you don’t have to worry about the dough sticking to the waxed paper as it heats up outside waiting to be grilled–especially if it is really hot and humid outside.) Brush the tops of the dough with extra virgin olive oil. Grill dough, oil side down over medium-high heat until browned and firm, about 5-6 minutes. Transfer to a clean surface grilled side up (We return the grilled crust to the individual plate.). 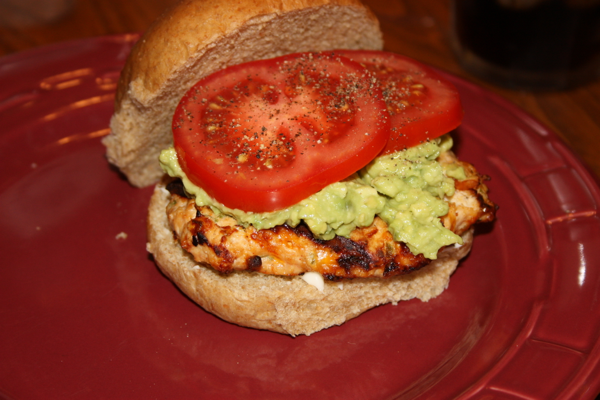 Top with desired toppings on the grilled side. Once topped, place assembled pizza back on the grill, closing the lid and cooking until the cheese melts and the toppings are softened (4-6 minutes). The finished pizza, ready to eat. Don't you wish you had some right now? 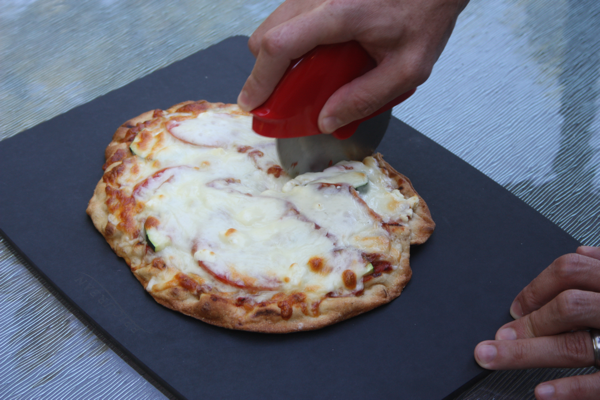 4 Comments on "Grilled Pizza"
Have you tried the crusts without the food processor? I don’t have one – would I be able to do this by hand, or not? Thanks! Karla, Try doing it with your mixer. I don’t see why it wouldn’t work. Let me know how it turns out. 1. I did it without help from my husband (running cooked dough in and out of the house to assemble the pizzas and recook them). It was a lot of back and forth. Get a runner to help–it will make it easier. 2. I set my grill for medium high (like the recipe said)for the first two crusts but I think it was a little hot–and maybe my grill runs hot. When I turned it down for the second set of two pizzas, they fluffed up a little better when cooking. I think I will cook at a lower temperature (say between low and medium next time)–they won’t cook as fast but it gives you more control. And the lower temperature crusts came out a nicer color and fluffed up better. Maybe it is just my grill but it’s not a bad idea to start at a lower temperature and increase the heat. 3. When I left the grill running (after cooking one side of the dough) and then came out to put the assembled pizzas on the grill (about 5 minutes had elapsed), it was over 500 degrees because I closed the grill lid. 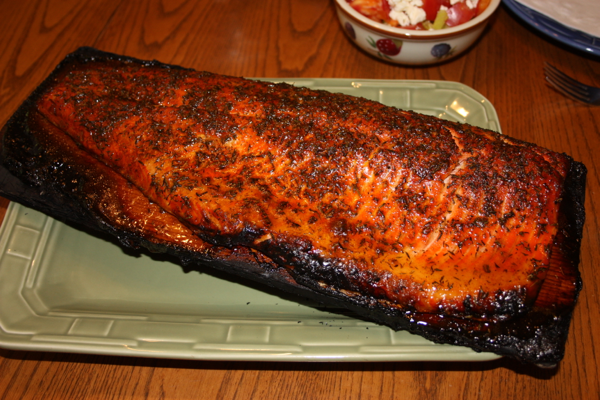 Make sure you leave the grill lid up when not cooking on the grill….otherwise the grill gets too hot. Overall, this is really a great recipe–between the dough and sauce…it just works! Thanks!